Cardiff Blues' back Gareth Anscombe admits he would be "proud" to represent Wales, but says he must first focus on playing well for his region. The 23-year-old, born in New Zealand, arrived in Cardiff earlier this month after joining on a "long-term deal" from Super Rugby side Chiefs. Anscombe makes his first Blues appearance at full-back on Sunday against Edinburgh. "I certainly wouldn't expect to walk into a Welsh team," he told Scrum V.
"I know I've got to play well for Cardiff first and that's where my head is at the moment. "Hopefully if I do the little things right and put my hand up, then maybe I might get the opportunity one day to pull on a red jersey, which I'd be pretty proud to do. "There's a lot of speculation about what can happen in the following weeks, but my focus right now is just to play for Cardiff." "I'm well aware of the rich traditions and history of the 10s and the legends here. It would be nice maybe to one day be among those sort of players." Anscombe, who can play fly-half or full-back, won the Junior Rugby World Cup with New Zealand in 2011. Despite representing the "Baby Blacks", Anscombe qualifies for Wales through his mother, who is from Cardiff. There had been speculation he could be drafted into the Wales squad for the remaining autumn internationals, but head coach Warren Gatland ruled this out. 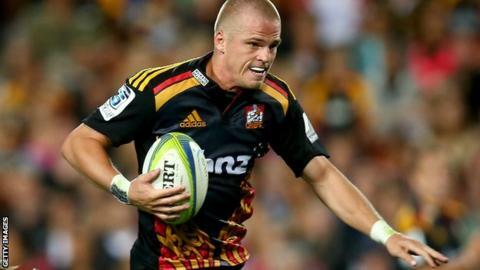 Anscombe played most of his rugby with the Chiefs as a full-back, helping the New Zealand side win the Super Rugby title in 2013. But he could feature at 10 for Blues as regular fly-half Rhys Patchell is suffering with a hamstring injury. "I don't mind playing full-back - I'd definitely be happy to play there - but I'd like to stick my hand up as a 10 over here for sure," he said. "I like to try and take on the line, I've got a bit of speed and I like the challenge. "I suppose that comes naturally to a lot of New Zealand players. "I'm well aware of the rich traditions and history of the 10s and the legends here. "It would be nice maybe to one day be amongst those sort of players." But Anscombe admits it was a difficult decision to change his allegiances to Wales. "It was certainly a tough decision and one that took me a long time to make. I had to speak to a lot of people that I trusted and respected," he said. "The opportunity that presented itself potentially - with the rich history here, the Welsh allegiance, and the legend of the Welsh rugby team - it just stuck as too good an opportunity to turn down." Watch the full Gareth Anscombe interview on Scrum V, BBC Two Wales from 19:00 GMT on Sunday, 23 November.